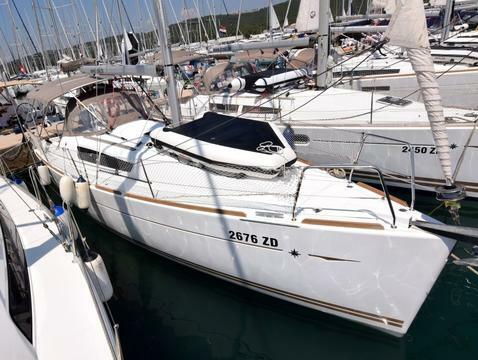 This very nicely build van de Stadt 34 is constructed by her current owner and he did a very nice job. She is very well finished and the mahogany details are a joy to look at. The entire ship is finished in epoxy so maintenance that usually comes with wood is not an issue here. The moment you see the ship, it shows that a lot of love and effort is put into her. Not only the technical construction but also the general atmosphere that is created on board. Very nice indeed. Besides all that, she is obviously build to the letter of the van de Stadt design and of course with the excellent sailperformance that comes with it. Within the ship you’ll find a practical layout with a large galley at portside and a navstation and wet cell at starboard. At portside is also the access to the open rear cabin. Amidships is the cosy saloon with comfortable settees and a table in the middle. In the forward section of the ship is the second cabin.